Dentures are a popular and convenient replacement for multiple lost teeth, especially for those patients who have lost their entire lower or upper teeth. However, a common complaint of the traditional denture is the ease with which they can slip out of place or rub against the gums. Sometimes, denture adhesive is just not enough to keep them in place. At Northway Dental Practice, we offer implant retained dentures for a more stable and less mobile missing tooth replacement. What is an implant retained denture? 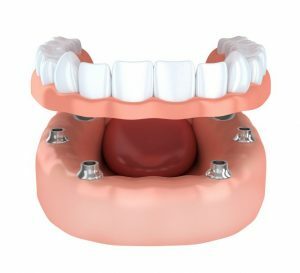 In simple terms, an implant retained denture is a removable appliance which can be clipped on and off implants that are embedded into the jaw bone. Small posts or abutments are fitted to the implants and work to hold the denture in place. As well as being fashioned to look like your natural teeth, the denture appliance will be built with pre-attached metal ‘wings’ which clip on and off the posts. The dental team will first need to establish the quality and strength of your jaw bone to determine whether you can undergo the implant procedure. We will create an individualised treatment plan and discuss each step of the process with you. If you are a denture wearer and would like to find out more, please click here or call 0151 526 2701 to book a consultation now.